This plan was ordered by the House of Commons. Different colours are used to denote buildings to be affected by renovations in Westminster. John Nash was a driving force behind many improvements in the Regency period, and his ideas of widening streets continued to influence city planning after his retirement. The narrow streets around Westminster Abbey had long been a dangerous area, with its mixture of criminals, courtiers, pilgrims and the wealthy. This was compounded by the abbey precincts being historically afforded sanctuary from the law. The widening of streets in such areas aimed to disperse the slums and tenements, opening them to light, air and policing. 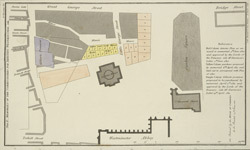 The area covered by this plan is where the modern Victoria Street and Parliament Square would be placed in the 1850s and 60s.